“I’ll Be Home for Christmas” is a Christmas song recorded in 1943 by Bing Crosby. 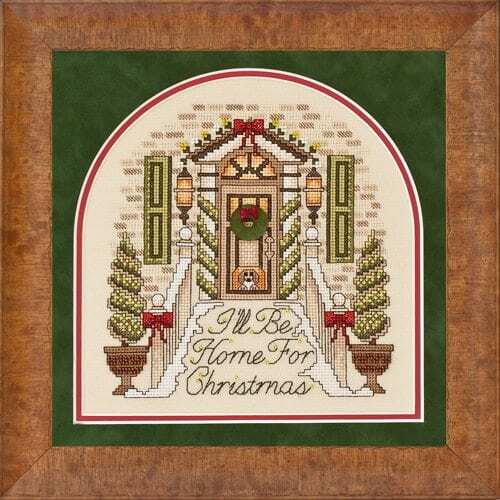 Originally written to honor soldiers overseas who longed to be home at Christmastime, “I’ll Be Home for Christmas” has since gone on to become a Christmas standard. The song is sung from the point of view of a soldier stationed overseas during World War II, writing a letter to his family. In the message, he tells the family he will be coming home and to prepare the holiday for him, and requests snow, mistletoe, and presents under the tree. The song ends on a melancholy note, with the soldier saying, “I’ll be home for Christmas, if only in my dreams”. Fabric: Stitched on 28ct “Bone” Jobelan by Wichelt Imports, Inc.
Design Area: 6-7/8″w X 6-7/8″h. Fibers: Uses a total of 19 colors of Sullivans floss. DMC and Anchor comparable colors are also provided. Other materials: Also requires 1 color of Kreinik #4 Very Fine Braid, 1 color of Kreinik Blending Filament, 3 colors of Mill Hill Beads, and 1 type of Mill Hill Glass Treasure.